For example, the computedValue hidden field is generated server-side and is different for each call. 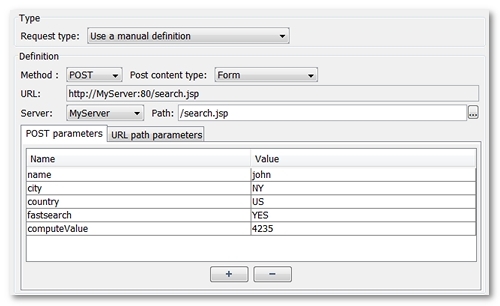 Using <FORM VALUE> as the value for computedValue allows extracting the value generated by the server. Furthermore, using <FORM VALUE> for the country field means you can choose a random value among those available for this option. Likewise, the fastsearch field will have a random YES or NO value during the test. 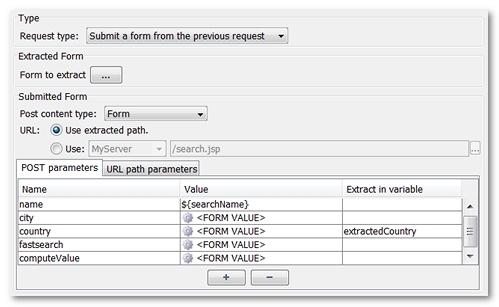 Therefore, the Form Extractor not only allows extracting the dynamic values generated by the server, it also allows using the various form choices in a random manner.